Most people - or at least artistic, whimsically-inclined, real people like you and me - want to transcend the traditional classifications of function and art. You know: functional pieces, with their practical and well-designed purpose, and then the creative display art with its hand-made, more creative connotations. What some might not realize, though, is that pottery can be both functional and uniquely artistic, all while being hand-made. Both. Can you imagine, a mug that is also a unique work of art? 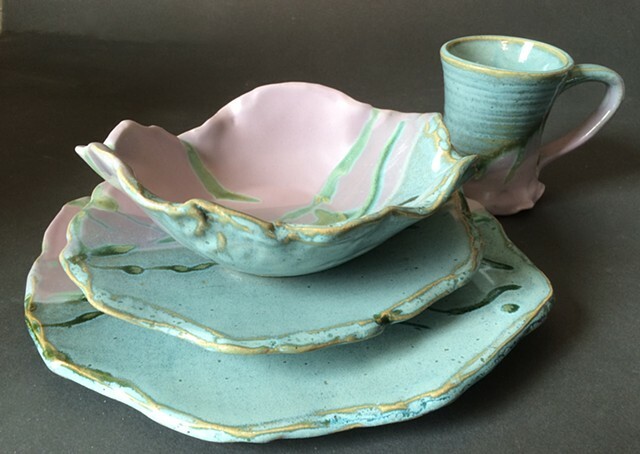 Locally handmade dinnerware, serving platters, teapots, brie bakers, butter bells, yarn bowls, pitchers, bowls, mugs, and vases are just some of the functional pieces you will find on this site. They are made with handbuilding and wheel throwing techniques, born and glazed separately so each has a distinct individuality. Choose from the listed items or get a custom-designed dinnerware set with a personal consultation. Contact Wendy Zaidman at wzaidman@gmail.com to get more information today! Please enjoy browsing my portfolio and etsy store for a special gift! Wendy is a dedicated artist and instructor. She would rather be in her home studio creating a work of art with her hands than almost anywhere else. She has studied various forms of art such as drawing, painting, and photography, finally setting her sights on creating and collecting pottery. She cannot resist the endless possibilities of creating with clay, whether it be 2- or 3-dimensional, intricately carved and hand-painted or glazed with large swaths of color, or choosing what combination of handbuilding and throwing on a wheel her piece entails. Inspiration for her designs is taken from her childhood and her surroundings, as well as the works she admires created by the artists she has had the pleasure to work with and learn from. Mountain living inspires her lush, hand-painted designs as well as the texture that is a familiar signature among her sculpture pieces. She creates a unique color palette and shape suited to the medium of clay. Sometimes soft, often vibrant, Wendy crafts functional pieces to be used in the home as well as personal, imaginative sculptures as display art with their own story. Wendy was juried into the Arches Artist Gallery at the Workhouse this year to become a member to display her new wall sculpture pieces. This distinctive art gallery is a collection of very talented souls that work and display a wide variety of the visual arts. This guild is specifically for Potters throughout the Shenandoah. Check out their website for more of Wendy's art that is on display. Together with members of this guild, Wendy will participate in the Holiday Pottery Event at Jim Barnett Park in Winchester, VA on the 24th, 25th and 26th of November 2017. Members of this guild are from Roanoke and across Virginia. She has been one of their featured artists and is honored to be a part of this collection of Potters. Their Fall Pottery Show will take place at Patrick Henry High School on October 13th, 14th, and 15th this year.